This quaint, 2 bedroom cottage is approx. 2 kms from the centre of Arganil, situated in the apple orchards of the village of Alagoa. The house has 2 bedrooms both with views across the fields. The main bedroom has a double bed and the second bedroom has two single beds, there is a separate shower room. The kitchen is well equipped with a gas cooker, fridge, microwave etc. 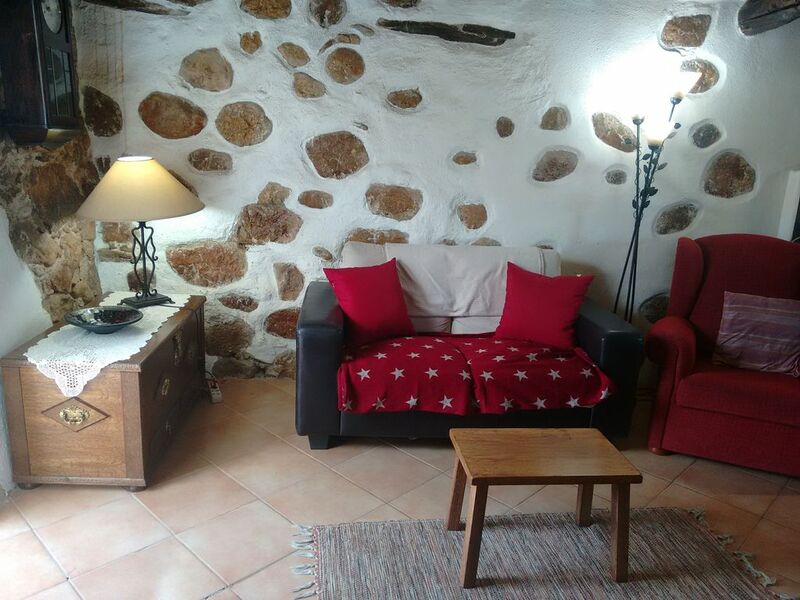 The living area is in the old cellar and retains the stone walls with a large fireplace and has a sofa and Portuguese satellite TV with some foreign channels, there is also a dining table and chairs here. Outside the private garden has outside dining furniture and 2 sun loungers with views across the fields to the mountains. There is also a BBQ in the garden and wifi internet access is provided free of charge. There are several river beaches in the area where you can swim, with the closest at Sarzedo approx. 1.5kms away and one at Secarias approx. 2kms away where you can hire canoes and pedaloes. Parking is on the grassy patch next to the front garden of the cottage. it is accessed by driving through the gap between the old barn and the wall just past the cottage. The cottage is ideally located,well equipped and cosy. We would thoroughly recommend a stay here ! Jane has provided a warm and cosy haven. Enjoyed having an open fire with plenty of wood provided. Lovely cottage, all you need, superb location! A lovely quaint character cottage, very well kept with everything you could need (including Wifi and a private sun trap garden). A beautiful and idyllic setting, very conveniently located for shopping, sight seeing (numerous great suggestions provided in a handy custom made guide in the cottage) and other amenities. Very helpful advice and assistance from the owner and friendly neighbours. Local people also very friendly and relaxed.The local cuisine is out of this world, the supermarket fish and meat counters carry an incredible range of amazing fresh choices; many local delicacies too. Would certainly recommend! Para quem não conhecia a zona foi um fim de semana lindo. A casa adorável e rustica é o nome que fica na perfeição.. Acolhedora isolada de tudo e por 3 noites foi lindo acordar ao som do galo de uma quinta vizinha espetáculo.a concelho a todos os amantes de turismo rural..mesmo e a zona enfim linda....sem palavras. A very nice cottage in a rural setting but only a few minutes from the town of Arganil. Jane was very helpful in giving us information and the cottage had everything we needed. I will definitely recommend to my friends. Recomendo a estadia nesta casinha muito bem aproveitada e decorada. Um estilo rústico muito acolhedor e um sítio muito tranquilo, sem dúvida! Ótimo para passar um fim de semana em família, como eu fiz. Obrigada pela sua estadia na minha casa de ferias. fico contente que voces gostaram a casa. Ate a proxima!